The location of the pain / discomfort felt is key in differentiating a heartburn from the more serious stomach ulcer. Ulcer pain tends to occur in the abdominal area -- especially just above the belly button. Heartburn - or the more serious form of heartburn: GERD - causes pain in in the chest and throat. Eating makes stomach ulcers feel better; but worsens heartburn or GERD symptoms. Olive Oil: Research suggests that polyphenols in olive oil may inhibit the bacterium that causes most stomach ulcers. The ulcer-causing bacterium Helicobacter (H.) pylori is tough enough to survive the acidity of people’s stomachs; and adding to the problem is that antibody- resistant strains of H. pylori are now found worldwide. Fortunately, the polyphenols in olive oil showed tremendous potential in the treatment of stomach ulcers. Not only could they withstand the harsh gastric juices of the stomach, but they also seemed to kill off H. pylori pretty handily -- even the antibiotic-resistant strains. Vitamin C & Rebamipide: In a recent study, researchers took people with age-related hearing loss and tested their hearing at various frequencies. They then gave patients 600 mg a day of vitamin C and 300 mg of the ulcer drug rebamipide. Result: in just 8 weeks, every single patient was able to hear better in the frequencies between 125 and 800 Hz. These frequencies are well within the range of human voice. The drug rebamipide is chemicaly similar to antioxidant compounds called quinolones. 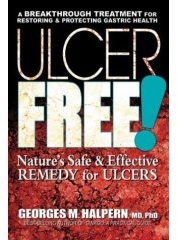 In fact, the reason it works against ulcers is that it protects the stomach from free radicals that are produced b the H pylori infection, which causes ulcers.